Jennifer Molson was 21, juggling a day job and night school to pursue her dream of becoming a cop, when she was diagnosed with multiple sclerosis. She woke up one morning with pins and needles in her hand, and within a week she couldn’t move her left arm. By 2001, five years later, she was living in the Ottawa Hospital under 24-hour care, getting around using a cane, walker, or wheelchair. When she was discharged on weekends, to spend time with her then-boyfriend Aaron, she had to rely on him for her every need. He’d cut her food into bite-size pieces, and bathe and dress her. When she lost control of her bladder or bowel, he’d help her go to the bathroom. “I had no feeling from the chest down,” Molson says. “I could touch something boiling on the stove and burn myself. I could touch fabric without knowing whether it’s sandpaper.” For patients like Molson, with a severe form of MS and no response to the available medications, there’s little hope. Two years later, her life had taken an abrupt turn. “I walked down the aisle and danced at my wedding, something I had always dreamed of doing,” she said of her marriage to Aaron in 2003. Now, 15 years later, Molson is still skiing and kayaking on the weekends. She works as a research assistant at Ottawa Hospital. What happened is something even esteemed medical specialists are venturing to call a “miracle”: The particularly aggressive MS that was on track to disable Molson entirely — and potentially kill her — is now virtually eliminated from her body. The game changer for Molson was an experimental chemotherapy and stem cell bone marrow transplant she got in 2002 as part of a study in Canada. Molson was one of a small cohort of 24 people with MS who received the high-risk therapy. Of the 24 patients, 70 percent saw the progression of their disease halted or reversed. Their experience, documented in a paper published today in the Lancet, is the first to describe any MS treatment that fully stops the disease over the long term without MS medication. MS affects about 2.5 million people around the world, particularly women in more temperate climates like Canada and the northern US. Instead of protecting the body from foreign invaders, in patients with MS the immune system turns on its host, wreaking particular damage on the myelin, a protective coating around the nerve fibers in the brain and spinal cord. Eventually these attacks can severely damage and destroy the nerves and myelin, interrupting the communication between the brain and body and leading to symptoms like numbness, trouble walking, and even blindness. But not all patients’ symptoms manifest in the same way. People with “relapsing remitting” disease experience MS in fits and starts — their symptoms show up for a few days or weeks, followed by weeks, months, or even years of remission. Other patients experience something even more insidious and grinding. It’s called “primary progressive MS,” and instead of bouts of remission they see a continuous increase in symptoms accompanied by a decline in health. Molson had secondary progressive MS at the time of her treatment in 2002. She had tried medication, and nothing worked. Her doctor, Mark Freedman (one of the authors on the Lancet paper), told her the stem cell transplant wasn’t going to cure her, but at best, if the procedure went well, her health wouldn’t worsen. Once she was accepted into the study, doctors began the procedure. They first put her through a short course of chemotherapy to stimulate the production of hematopoietic stem cells, which regenerate the immune system, in her blood. They then hooked her up to a machine that cycled through her blood 32 times over the course of seven hours, in order to collect stem cells. Those stem cells were then purified, wiped of any memory of the disease, to later be transplanted into Molson through a blood transfusion. Growing a new, disease-free immune system meant Molson’s body had to relearn how to defend itself from disease-causing bacteria and viruses. She had to get her childhood vaccines again. But she was also more vulnerable to infection, and wound up developing a blood infection, shingles, and serious bladder infections shortly after the transplant. “It took me at least a year before I started to feel human again,” Molson says. Around a year and half after the transplant, she began to slowly return to some likeness of her pre-MS self: She was walking without using a cane, she could shop in the grocery store again, and eventually she didn’t need to nap every afternoon. Molson, now 41, says, “I haven’t had any MS symptoms in 14 years. And I’m not on any MS medications.” That’s a big deal given that the medications usually involve daily pills or frequent injections. Molson’s hair never fully grew back, and she also contends with daily heartburn and digestive issues, which she takes medications for. Drs. Freedman (R) and Atkins (L), two researchers on the Lancet paper. The study that gave Molson this chance was impressive in its scope and its execution — conducted at multiple hospitals by hematologists and neurologists in Canada and lasting nearly 20 years, from conception to publication. It built on decades of basic research about MS, stem cells, and the immune system, including years of experience using the treatment in patients with blood and bone marrow cancers like leukemia and lymphoma. Other scientists have already seen promising results in MS patients using similar treatment protocols, but none have managed what Atkins’s team has: to completely halt the disease’s attack on the brain —no relapses, no new MRI lesions in all surviving patients — and for such a long follow-up period. Several researchers who were not involved with the experiment — and who typically are reserved about novel treatments — told Vox they were excited and hopeful for the treatment’s potential to benefit others with the disease. “I think this is going to be the new standard of care for progressive MS,” said Rudnicki. “It’s exciting — an important proof of principle,” said Jeffrey Gelfand, a neurologist specializing in MS at the University of California San Francisco. Still, there are major caveats to consider. This study was small and lacked a comparison or control arm. Similar, larger studies are needed to confirm the results, and it’s not clear what will happen to patients like Molson in the much longer term. 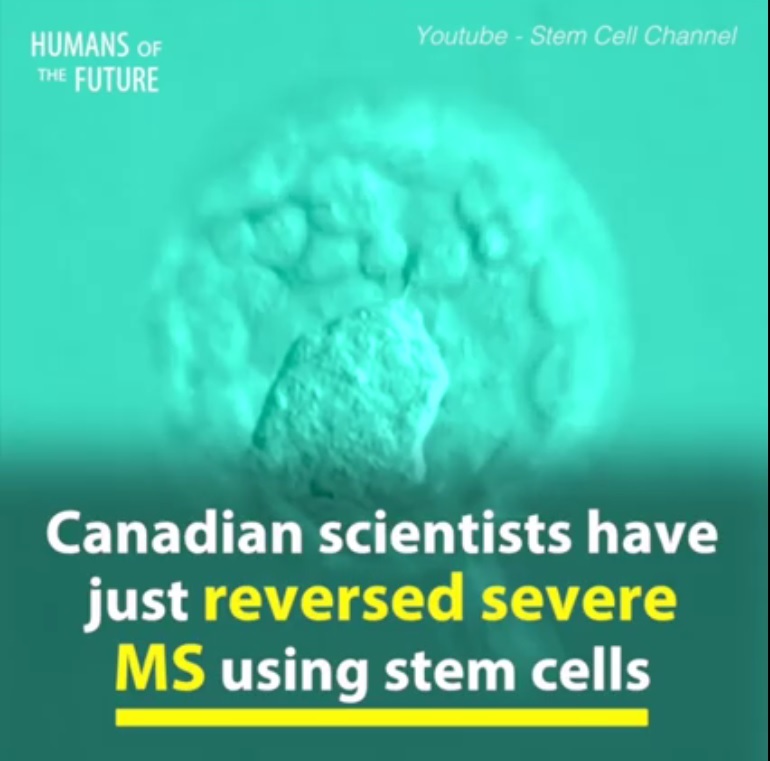 Ottawa Hospital hematologist Harry Atkins, the researcher who led the study, pointed out that only about 5 percent of MS patients would be eligible for this treatment: again, the minority who have an aggressive form of MS that’s not responding to any treatment. And not everyone in the study had results like Molson’s. Of the 24 patients, 70 percent saw the progression of their disease halt or reverse, but the other 30 percent continued to worsen. One patient died, which puts the potential for death from this procedure at around 4 percent, and severe infections after stem cell treatments — the kind Molson picked up, or worse — are also common. And there are questions about the very long-term effects. It’s not clear what the next 10, 20, or 50 years look like for patients like Molson. Already, Atkins and his team have been working on other applications for this stem cell procedure. They managed to reverse “stiff-person syndrome” — a rare neurological disease that causes the muscles in the body contract to the point of complete immobilization — in one patient. And there’s talk of applying the treatment to myasthenia gravis, another incurable autoimmune disease. Correction: An earlier version of this article misstated the worldwide prevalence of MS.